Before having my two children I had very irregular periods because I have polycystic ovaries. At the age of about 18 I was told that I might find it hard to fall pregnant so needed to go on the pill to regulate things until the time came for making babies. Fifteen years later I waved goodbye to the pill and hello to pregnancy. It took 6 months to fall pregnant with Poppy and a mere three weeks with Louis. I felt very lucky considering that I had always been led to believe that it might be a real struggle. Anyway, since having the children, my body has decided that it now wants to have really regular periods which are accompanied by horrendous tummy cramps and even worse moods. Honestly, I don’t know what’s happened to me. I never used to get PMT but I have now turned into some sort of monthly She Devil. The bitter irony is that I would have killed for such regularity in the run up to having babies as it would have given me confidence that my body was working properly. But now…well it’s all a bit pointless. I’ve had my babies and could definitely do with going back to having periods every three months. Anyway, my Mum (who can always be relied on to tell it how it is) called me the other day and told me in no uncertain terms that my PMT is horrific and that I need to do something about it. 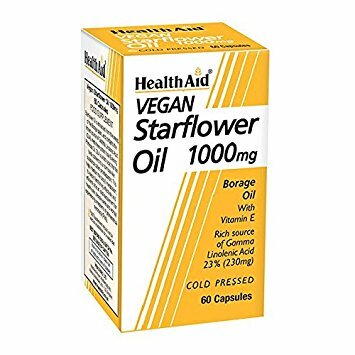 She then recommended that I try Starflower Oil which she had heard great things about. To cut a long story short, this stuff has worked miracles. My last period was lighter than usual, I had next to no tummy pains, and moods…what moods? My PMT was practically non-existent. I’m so relieved, but not as relieved as my family are! Oh and it’s also made my skin look nice which is an added benefit. I’ve been using this one from Health Aid and it works a treat.